Microspace Communications, along with 2 other Capitol Broadcasting divisions, participated in the 2017 Salvation Army Angel Tree Program. A total of 57 Angels were adopted by the 3 divisions combined. 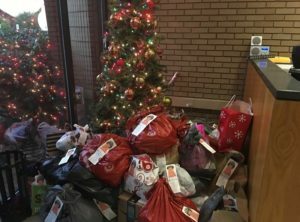 Microspace staffers chose an Angel from the tree with a child’s name, age, clothing sizes and particular wish list items. The staff then purchased for that child new clothing, shoes and toys to help make Christmas 2017 a memorable one for the children. The Salvation Army supports over 6,800 children in Wake County with their Angel Tree program. The focus of the program to fulfill the children’s biggest need of new, warm clothing for the winter. Children ages 0-11 years old are the recipients of the generous gifts. The Angel Trees are on display at Cary Towne Center, Crabtree Valley Mall, and Triangle Town Center from November 10 through December 15th.